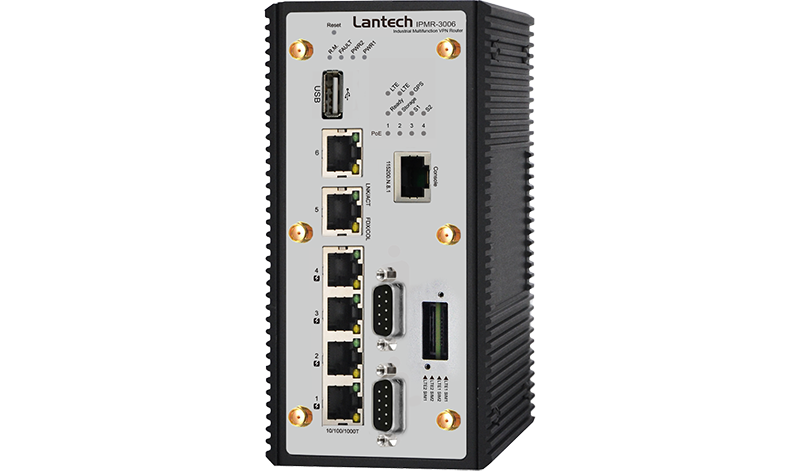 Lantech IPMR-3006 series is a next generation industrial multi-function VPN router w/up to 2x LTE modem + + 6x Gigabit Ethernet switch incl. 4 PoE ports + 2 serial ports that supports advanced function of VPN, Load-balancing**(Basic & Full package), Protocol gateway(Modbus), EMMC Flash Storage**, and LTE quad SIM fail-over for industrial applications. The dual core CPU with 1.6GHz + 256M flash enables the router to multi-task smoothly. With dual LTE module design (2L model), 4 SIM card slots, TMR-5002 can allow auto-swap, failover & failback between multiple service providers for real non-stop connection. With concurrent LTE modules, it can also allocate bandwidth by “ Load Balancing** with 8 schemes between multiple WANs. With one mobile LTE module (1L model), 2 SIM card slots, IPMR-3006 provides redundant link between two service providers. Both GPS and Russian GLONASS systems are supported. Besides traditional VPN peer to peer tunneling, IPMR-3006 support latest Multi-Site VPN function that is an efficient way for mesh tunneling. The registration is under cloud service and encrypted by SSH makes the connection easy and safe. 2 sets of DIDO function can support additional high/low physical contact for designate applications besides Port / Power events, for example, DIDO function can trigger alarm if the router was moved or stolen. In case of events, the IPMR-3006 will immediately send email** and trap. When the router is at remote area with limited access, Web/SMS** control can help to get router status or remotely reboot by Web/SMS**. The IPMR-3006 is able to work from 9VDC to 56VDC for PoE at/af with PoE budget 80W@12V /80W@24V&48V that is particular good for vehicle, rail train, depot etc. application. The built-in environmental monitoring can detect router ambient temperature, voltage, current and total PoE load where can send the syslog, email** and SMS** alert when abnormal. The IPMR-3006 is designed to meet with industrial network environment with IP 30 housing. It passed tests under extensive Industrial EMI and environmental vibration and shocks standards.